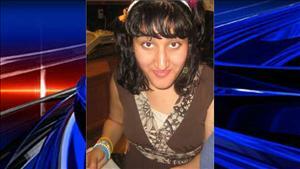 15 year old Shabnam Ahmadyar was reported missing on March 31, 2012. She was last seen walking away from her home on the 4800 block of Chamberlin Circle on Friday afternoon. Shabnam Ahmadyar is considered an at risk missing teenager as she suffers from paranoid schizophrenia. The Elk Grove Police Department has received help in the search for the teen girl from the Sacramento Sheriff’s Search and Rescue volunteers, the U.S. Coast Guard boat crew, Air National Guard helicopters, Cal-EMA and California Rescue Dog Association. Ahmadyar is described as a 15-year-old Middle Eastern girl, 5’5″, weighing 125 pounds, with black hair in pony tails and brown eyes. She was last seen wearing a gray hooded jacket with matching sweatpants. She has been diagnosed as a paranoid schizophrenic and functions well below her age level. The search was being concentrated in the area of Hood-Franklin where she was last spotted Friday night. Also, the family had identified clothing found at Hood Rd and the Sacramento River on a delta boat ramp as Ahmadyar’s. However, on Saturday, investigators discovered images of Shabnam Ahmadyar on store surveillance video in the town of Franklin. She has also alleged to have been spotted in Walnut Grove. If anyone has any information regarding the whereabouts of Shabnam Ahmadyar, please contact the Elk Grove Police Department Dispatch Center at (916) 691-5246.